New York, 6 July 2010 — Queens Pride House is appealing to members of the lesbian, gay, bisexual and transgender community for support in the face of possibly devastating state funding cuts. The only LGBT community center in Queens, Pride House has not yet received a definitive response from Gov. David Paterson as to the disposition of approximately $80,000 in grants from the State of New York that are hanging in the balance as the governor threatens to veto funding appropriated by the state legislature for scores of community-based organizations throughout the state. “As you may already know, many non-profit organizations are struggling with funding, and Queens Pride House has been as vulnerable as any to the negative impact of the downturn of the economy in general and the State of New York’s budget crisis in particular,” executive director Daniel Castellanos wrote to members of the Queens Pride House mailing list in a message posted to the list on June 30. “The consequences of a veto by the governor will be the most dire for the most vulnerable people we serve, including those with health and social service issues, especially for clients who are homeless or unemployed,” said Pauline Park, vice-president of the board of directors. “Of the three state contracts totalling approximately $80,000, we have expended about $50,000 on the contracts, including payroll and other expenses,” noted Castellanos. “Loss of these contracts could force us to cut back on as much as one-third of our client services and dismiss one full-time and three part-time employees,” he added. Queens Pride House has been awarded an Assembly grant through the LGBT Health & Human Services Network consecutively for eight years, with the current amount of that grant standing at $25,000. QPH has also received a Senate grant in the amount of $40,000 and an grant of $15,000 from outgoing Senator George Onorato of Queens, who is retiring this year. “Our proposed workplans, contract period, and budget were approved by the New York State Department of Health and those contracts were issued,” Castellanos pointed out. 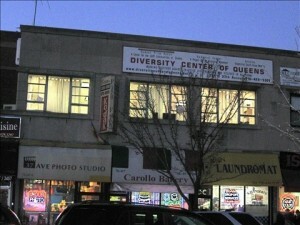 Queens Pride House was founded in 1997 and is based in Jackson Heights, which is part of Council District 25. In previous years, Queens Pride House had received funding from former Council Member Helen Sears, who was defeated in September 2009 by openly gay Council Member Daniel Dromm. The election of the first openly gay elected officials in the borough of Queens in November 2009 seemed to some members of the LGBT community to herald a new era in the history of the community, but both Council Member Daniel Dromm (D-25) and Council Member Jimmy Van Bramer (D-26) declined funding requests from Queens Pride House for fiscal year 2010-2011. In previous years, Queens Pride House had received funding from former Council Member Helen Sears (who was defeated in September 2009 by Dromm) as well as from her predecessor, John Sabini. “The loss of any of our state or city grants would seriously compromise our ability to support partnerships with some groups serving underserved individuals and their families,” added Rosa Bramble Weed, a member of the Queens Pride House board who also runs the Positive Life program, a program for Latino HIV positive individuals supported by Queens Pride House. In fact, the community center also provides subsidized space to two substance use groups, two arts organizations, and several non-profit organizations serving immigrants. However, Queens Pride House has received a small grant from Council Member Julissa Ferreras (D-21) to continue Charla!, a support group for Latina lesbians offered in partnership with Las Buenas Amigas (a group for Latina lesbians in New York City). “Charla is a monthly discussion group that meets every 3rd Tuesday of the month at Queens Pride House and focuses on health and emotional issues of interest to Latina lesbians in New York,” noted Bramble Weed.